"A full course of claws and fangs... Please enjoy." Valkenhayn R. Hellsing (ヴァルケンハイン＝R＝ヘルシング), sometimes known as the Silver Wolf, is the eternally loyal servant of Rachel Alucard. He is one of the Six Heroes who fought against the Black Beast during the Dark War and a former Immortal Breaker, having worked with Relius Clover in his youth. After being saved by Clavis Alucard, Valkenhayn swore his loyalty to the Alucard Clan, keeping his oath for over a century. 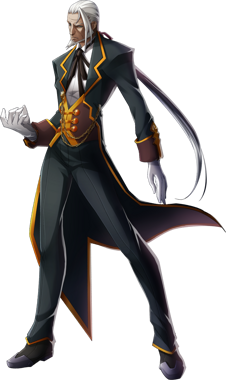 Originally, Valkenhayn appeared as an NPC in BlazBlue: Calamity Trigger and was made playable as the second DLC character for BlazBlue: Continuum Shift. Valkenhayn's human form is that of an elderly man with long white hair tied with a pink bow, a chinstrap beard, and tan skin. His teeth have sharp canines like that of a wolf. His clothing consists of a Victorian gentleman's suit with black pants, black steel-toed shoes, a white shirt and black bowtie, a brown and gold vest, and a black and gold coat with golden chains attached to it and brown cuffs. Valkenhayn's wolf form is that of a large gray wolf with black paws and a black face. The fur on his back, tail, and chin is the same color as his hair in his human form, and his pink bow is situated on his tail. Valkenhayn is also capable of transforming into a huge, heavily muscled humanoid werewolf. In addition, he can transform his limbs and head individually into his wolf form. As a young man, Valkenhayn had straight, spiky brown hair which turned gray over time, and didn't wear his coat. The bow in his hair was red instead of pink. Calm and orderly, he mostly keeps to himself. However, he shows no mercy to those who would harm Rachel. A gentleman through and through. Valkenhayn is the ultimate butler who follows his mistress' every wish, and knows Rachel as well as she knows herself. He is frequently seen preparing her tea and pastries, and is eager to lend his ear to her. He disapproves of Ragna the Bloodedge, finding him to be a distasteful individual who frequently gets on his master's nerves. Unlike both Nago and Gii, Valkenhayn is never seen taking the brunt of Rachel's wrath. Valkenhayn has an immense amount of respect to the Alucard Clan, and owes his life to Clavis. This is how he found himself in the vampire's employment, but it is not out of this promise that he still serves the clan to this day. His loyalty is not to the clan but to Rachel herself, arguably being her closest friend and confidant. For over 50 years he stood by her bedside as she rested to gain power, taking care of the entire Alucard residence by himself. In the Dark War, Valkenhayn was cold and distant to anyone who was not an Alucard. However, he was not unapproachable, and would offer advice to his comrades during the darkest times of the war. Regardless of his loyalty to the other Six Heroes, Valkenhayn's loyalty ultimately remained with the Alucard's, and he disappeared immediately after the war ended. As a young mercenary in the Immortal Breakers, Valkenhayn had yet to cultivate his loyalty and dignified grace. He was an angry young man who was always rearing to fight and even kill - his only reason for joining the group was to fight those with the strongest of souls. This attitude of his rarely surfaces in Valkenhayn's old age, but to those who threaten Rachel, he turns from a mild-mannered butler into an unstoppable machine. As an older gentleman, Valkenhayn keeps up good relations with numerous individuals, such as Torakaka, Jubei, and Bang Shishigami. He is willing to impart pearls of wisdom to others, and is always ready to help please his fans, such as Iron Tager. Relius is one of Valkenhayn's greatest enemies, although the reason for their personal vendetta remains unknown. Valkenhayn also greatly misses Clavis, and wishes that he could bring him back to life. A lycanthrope - a being which can freely shift between the forms of a human and wolf. Valkenhayn may be old, but that does not make him even remotely weak. Having lived for over a century, he has an incredible amount of experience in both life and battle, something that he frequently puts to use. It appears he also has the ability to teleport, and was select as one of the chosen. As a lycanthrope, Valkenhayn exists outside of logic, which means he was able to battle the Black Beast without the need of a Nox Nyctores. Valkenhayn does not like relying on the power of his wolf form to fight, instead mainly staying in his human form. Despite this, the butler can transform any part of his body into the parts of his wolf form, such as his head, arms, legs, hands, etc. This makes him a tricky opponent to fight, as he can easily deliver a sharp slash with his claws or bite with razor sharp teeth. Even without the benefits of this form, Valkenhayn can launch devastatingly strong kicks and punches; his aged appearance belies a fearsome strength. In gameplay, Valkenhayn's Drive is Werwolf, which allows him to transform between wolf and human. As a wolf, Valkenhayn loses the ability to guard, but becomes extremely mobile and can deliver powerful dashing attacks across the screen. As well as his numerous physical abilities, Valkenhayn is also exceptionally well-travelled and is trained in numerous techniques. One technique of his is to give someone a temporary boost in their range of mobility, but the process is extremely painful, as is when the effect wears off. Valkenhayn is also medically trained to the point of being able to bring people back from the brink of death, but only with external injuries. For all his physical strength, Valkenhayn is not capable of prolonged battles. His old age has stripped him of the stamina he once had in his youth, and deep down, he is still reckless, impulsive, and quick to anger - even the slightest ill remark towards Rachel is enough to make him lose his temper. With his exploitable rage, old age, and unwillingness to battle in his wolf form, Valkenhayn is not the opponent he once was, and struggles against some of the stronger beings in the BlazBlue world. An old-fashioned butler who has served the Alucard family since the previous generation. Not only does he excel as a butler and as a person, but he is also knowledgable in a wide variety of topics. He chases after Rachel, who left her castle after sensing a calamity in Kagustuchi. A member of the "Six Heroes" who defeated the Black Beast during the First War of Ars Magus. The ancestor of wolf beastkin, he currently serves the prestigious vampires of the "Alucard family" as a butler. Now that his enemy Relius Clover has appeared, he feels that confrontation is inevitable and accompanies Rachel to fulfill her wish. One of the Six heroes that defeated the Black Beast. He is a wolf beastkin, and a servant to the Alucard Family, a noble line of vampires. He is not only an excellent butler, but has honed a wide variety of skills during his lifetime, including the delicacy of tea, which comes in handy when serving his current master, Rachel. He carries himself with an aura of gentility, and never says more than he must, but when faced with one who wishes to harm his master, Rachel, he shows no mercy. Despite Relius, his current arch nemesis' appearance, Valkenhayn suppresses the urge to fight and follow's Rachel's wishes, making his way to the land of battle: Ikaruga. One of the Six Heroes and an old bulter that serves Rachel. Normally calm and collected, he never speaks insolently. He has a courteous demeanor, but will show no mercy to those who disrespect Rachel. The mobile game Mabinogi Duel stars Valkenhayn as a playable card. The Korean-style horror game White Day: A Labyrinth Named School has outfits based on Valkenhayn's appearance. 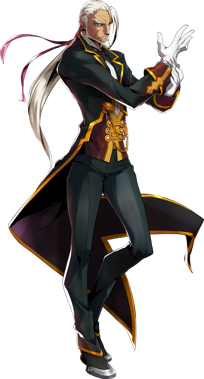 In the BlazBlue 10th Anniversary Character Poll, Valkenhayn placed 35th out of the 84 candidates, tying with Mu-12. He scored one place above Carl Clover and one place below Iron Tager, having been beaten by one vote. He had 564 votes. Valkenhayn's birthday is the earliest day which Respect for the Elderly Day can fall. Until 2003, it was always celebrate on September 15th. All of Valkenhayn's moves reference wolves and hunting, and are named in German. Valkenhayn is the only character to have appeared with speaking roles in the C-series, Phase Shift series, and the Bloodedge Experience series. Valkenhayn is one of three characters who have never had their Japanese voice actor appear on Blue Radio. The other two are Carl and Amane Nishiki. Some of the tea that Valkenhayn serves Rachel is from a place called Amaruga. Torakaka has also been known to give him exotic teas to serve Rachel. The pink bowtie that holds Valkenhayn's hair and mane together was a gift from Rachel. Valkenhayn is the only member of the Six Heroes who did not directly confront Yuuki Terumi after the Dark War had concluded. Before Clavis' death, Valkenhayn claimed to have been in his service for 100 years. The amount of time he has spent serving the Alucard Clan sums to over 200 years. Valkenhayn was the second DLC character in the series, being introduced after Makoto Nanaya for BlazBlue: Continuum Shift.